If you have visited Aberdeen Exhibition and Conference Centre, why not submit your image of the view that you had. 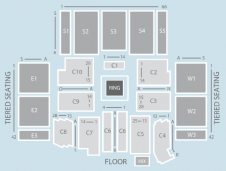 To find your seat at the Aberdeen Exhibition and Conference Centre as quickly as possible, please use the West Entrance if you are seated in blocks numbered W1, W2, W3, C3, S3, S4, GA1, GA2, GA3, GA4 (standing section). Please use the East Entrance if you are seated in blocks numbered E1, E2, E3, C1, C2, S1, S2, GA5, GA6, GA7, GA8, GA9 (standing section). Seating is detailed below. 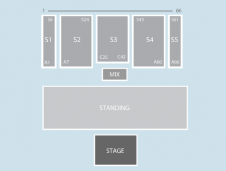 Seat blocks closest to the stage are C1 - C5, with C3 being centrally in front of the stage. Seats in this section are numbered from A1 (stage left) to A68 (stage right). Numbers increase as you move away from the stage. 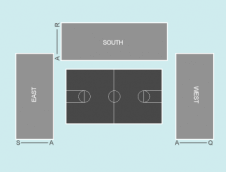 To each side of the arena you will find blocks W1 - W3 and E1 - E3. At the back are blocks S1 - S5. The arena seats around 8,500 people depending on seating configuration. We currently do not have any events listed at Aberdeen Exhibition and Conference Centre, please click on a seating plan for more information about seat locations at Aberdeen Exhibition and Conference Centre.